BlackRock is to take a minority equity stake in German digital investment manager Scalable Capital Investment to support the company’s future growth. Scalable Capital announced the signing of a €30m funding round, led by BlackRock alongside existing investors HV Holtzbrinck Ventures and Tengelmann Ventures. This funding round is one of Europe’s largest for a digital investment manager to date, bringing Scalable Capital’s total funding to €41m. BlackRock, said in a joint statement announcing the deal, that it has taken a significant minority equity stake in Scalable Capital to help them “grow their business with financial institutions and corporates”. Patrick Olson, BlackRock’s chief operating officer of EMEA, will join Scalable Capital’s Supervisory Board. 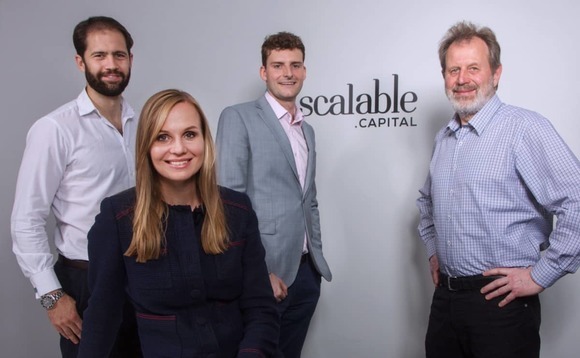 Scalable Capital, based in Munich and London, has already gathered over €250m (£217m) of assets from over 6,000 retail clients, since its launch just 16 months ago. The firm has seen strong growth in the UK and Germany and has the ability to expand its offering even further across the Continent. The offering provides a flexible multi-language and currency platform that can operate across multiple international tax and regulatory regimes, the statement said. Olson said: “The retail distribution landscape is evolving at a rapid pace, as consumers increasingly engage with their financial investments through technology. BlackRock added that it has a “deep heritage” in technology, from the creation of Aladdin, its risk management and analytics platform, to its more recent expansion in digital wealth management solutions. The investment in Scalable Capital complements BlackRock’s existing digital wealth management suite, which includes Aladdin Risk for Wealth, iRetire, iCapital and FutureAdvisor in the US, it said. Adam French, co-founder and co-chief executive at Scalable Capital, said: “BlackRock shares our vision that technology is not just a competitive advantage but a requirement for wealth management businesses to be successful in the future. Its investment in our firm is a fantastic validation of our work so far, opens up new growth avenues for our business and firmly establishes us on the digital wealth management map in Europe. Scalable Capital added that it expects the changing regulatory landscape in Europe to result in the need for financial institutions to increase investor protection, value for money and transparency. Consequently, firms will be seeking technological solutions to assist with portfolio construction, risk management, and digital distribution. Scalable Capital’s platform provides a practical solution for firms looking at technology to help shape their business models for the future. (Pictured above L-R Simon Miller, UK co-founder, Dr. Ella Rabener, CMO & UK co-founder, Adam French, CEO UK & co-founder, Prof. Stefan Mittnik, PhD, co-founder & scientific advisor).